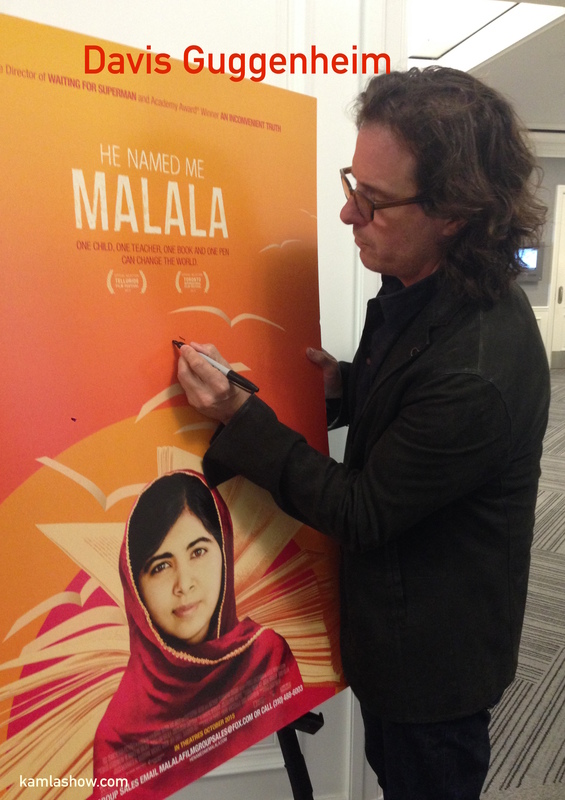 Davis Guggenheim’s new documentary He Called Me Malala is a profile of Malala Yousafzai. The brave young Pakistani Nobel Peace Prize winner needs no introduction. She narrowly cheated death in October 2012 when she and her two friends were shot by the Taliban in Pakistan’s Swat valley. The girls were on their way to school when their vehicle was attacked. Before her accident Malala was an outspoken advocate for educating kids, especially girls and after the accident her resolve to stand up for children’s right to education has only strengthened. Malala chose not to remain silent, but to fight back. She believes education is a fundamental right. Today, Malala’s name and education for children are mentioned almost in the same breath. Guggenheim remembers first hearing the story of Malala when she was shot in Pakistan, but did not know that one day he would end up making a documentary on her. He spent 18 months shadowing Malala and her family and traveled with her to Africa and other places. Malala lives in the UK with her family and she goes to school there. She and her family are not in a position to return to Pakistan. We spoke with Guggenheim about the making of the film and what he learnt from making it. What kind of cultural landscape did Guggeneheim navigate while making the film? He feels lucky to have made this film and learn about the Muslim world, especially the Pashtun culture of Malala and her family. When you visit other cultures you learn so much and it opens up your mind he says. The news report we get from this part of the world is scary and violent and it is really not that way he adds. He Named Me Malala highlights the close relationship between Malala and her father Ziauddin Yousafzai and the powerful influence he had in shaping her thoughts and her right to get an education. He started a school in Swat Valley and believed that his daughter had a right to speak her mind and get an education. His attitude was in direct contradiction to what the Taliban had to say about educating girls. Interestingly, he named his daughter after a 19th Afghan girl called Malala of Maiwand, who lost her life fighting against the British during the second Anglo-Afghan war. We get to see Malala the teenager, who likes to boss over her younger brothers, loves watching cricket and hanging out with her family at the dinner table. We also see how Malala and her father work tirelessly to help young children get access to education in Africa and in other parts of the world. While the movie gives you a basic profile of Malala, you are left wanting to know more about Malala and how she juggles her time between studying and working as an activist. How does she do it? What is a typical day or a week in her life? And I wishe I had heard more from Malala’s mother about her daughter’s crusade for educating children. Those were some of the questions that remain unanswered. Guggenheim says the target audience for He Named Me Malala are his girls and other girls around the world. And that makes sense since the film provides an excellent and inspirational example of what it takes to stand up and get your voice heard. Malala is an inspiration. He Called Me Malala releases Friday, Oct 9 in San Francisco Bay area.